Belize fly fishing, bonefishing, permit fishing, tarpon fishing, saltwater flyfishing, all inclusive vacations at Turneffe Flats lodge. For more than three decades, Turneffe Flats has been known as one of the world's premier flats fishing destinations combining a remarkable fishery with excellent English-speaking guides, top-notch equipment, superior accommodations and service. The ability to sight-fish for BONEFISH, PERMIT and TARPON on any given day makes Turneffe one of the few places where a Grand Slam is always a possibility. Turneffe Atoll is the largest of only four coral atolls in the Western Hemisphere, and is best-known for its variety of saltwater fishing. Turneffe Flats is located on a remote, picturesque point featuring white sand beach and coconut palms. An expansive bonefish flat is right outside your front door and a healthy coral reef is only a stone's throw away. 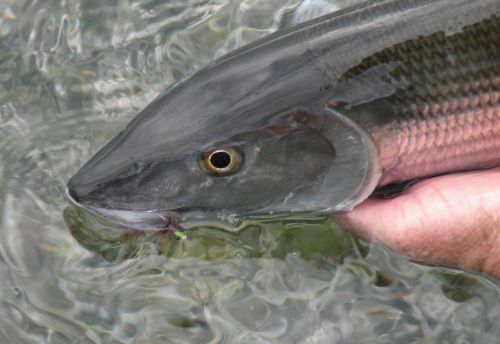 Bonefish have been a primary target of Turneffe Flats' anglers for more than 30 years. While wading the expansive flats on the seaward side of Turneffe, you will regularly see large schools of bonefish providing an unequaled opportunity for new saltwater anglers to learn the basics of the sport. There are also plenty of challenging opportunities for those who enjoy stalking larger fish (some in excess of 10 pounds) in skinny water. Our ocean-side flats are some of the most picturesque flats anywhere. 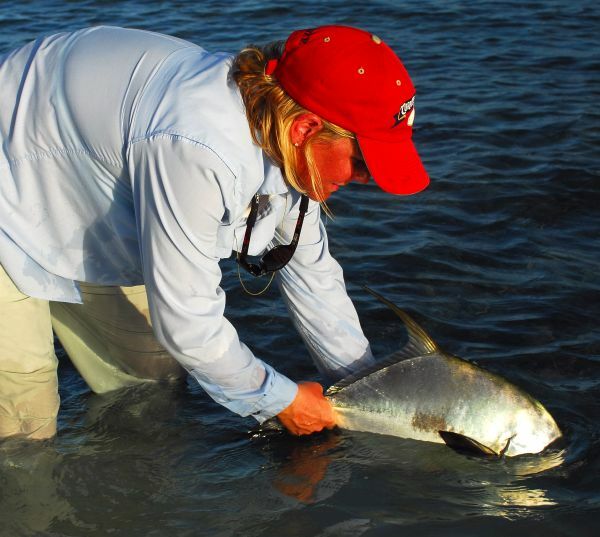 Permit are the prime objective of many anglers at Turneffe Atoll. With Turneffe Flats leading the way, Belize has gained a reputation as the permit capital of the world. Many guests have celebrated their first-ever permit with us and many return year after year to take advantage of Turneffe's exceptional permit fishery. Most permit are found as singles or in small groups on the flats and bars throughout the atoll, although we also frequently see larger schools of permit tailing in shallow water. Most of our permit fishing is done from a poled skiff but there is also excellent wade fishing for permit on our ocean-side flats. Tarpon are perhaps the ultimate challenge of saltwater fly fishing. Although there are always some resident tarpon to be found, our migratory tarpon season extends from mid-April to October. Tarpon inhabit the creeks, channels and lagoons of the Atoll and most tarpon jumped are 60-90 pounds, with some fish in the 100-150 pound range and occasional monsters approaching 200 pounds. The interior of the Turneffe Atoll offers miles of mangrove-lined bays, creeks and lagoons to fish for snook, various species of snapper, jacks and barracuda with poppers or Clouser minnows. This can be some very exciting saltwater fishing with either a fly rod or spinning gear. Barracuda are an underrated and acrobatic game fish inhabiting the reefs at Turneffe in large numbers. 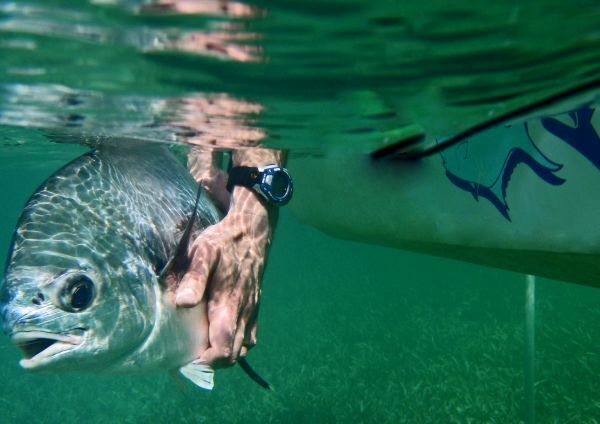 Some anglers prefer to troll a fly for them, but they can also be taken by sight casting on the flats or by casting poppers into the deeper holes along the reef. Along the reef, wading anglers can take snappers and jacks by casting deceiver patterns or poppers into the surf. Spending some time during your stay at Turneffe "chasing" other species is always fun and usually rewarding. We fish from 16-foot Dolphin Superskiffs custom built in the U.S. These are comfortable skiffs that cut the chop when running and pole well in skinny water. They have large casting decks and rod holders for six rods. All skiffs are equipped with VHF radios and safety gear. Lean bars are available upon request. Our fishing schedule is as flexible as possible. A standard day's fishing is about 8 hours. Generally the fishing day begins after breakfast and ends around 5 p.m. although it is adjusted depending on the tides and other factors. Each day you will have the option to take a delicious packed lunch or return to the lodge for the noon meal. Our Managers will coordinate your fishing each evening for the following day. Early morning fishing, particularly for tarpon, can be exceptional, and arrangements to go tarpon fishing before breakfast are easily made. We believe strongly in protecting the fishery at Turneffe. With rare exception, all fish at Turneffe Flats are released. In 2009, Turneffe Atoll Trust, a non-profit organization associated with Turneffe Flats, led efforts to protect bonefish, permit and tarpon as "Catch & Release" species throughout Belize.